The Hard Rock Cafe Seattle opened in early 2010, and it remains the only cafe in the popular chain in the state of Washington. Seattle's Hard Rock Cafe is located in the heart of historic downtown, near the famous Pike Place Market. The building in which the restaurant is housed is historic, too, as well as environmentally designed, and the memorabilia on display is largely Seattle-specific. The Hard Rock Cafe in Seattle, like all restaurants in the chain, features a traditional American menu, and an on-site Rock Shop where you can buy all kinds of Hard Rock Cafe merchandise. The Seattle location also features a music venue on the second floor, called the Cavern Club after the Liverpool basement club where The Beatles got their start. 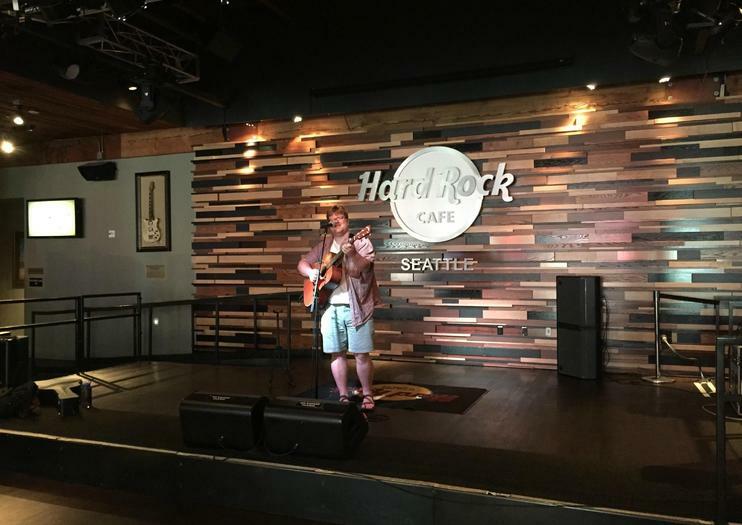 Seattle Hard Rock Cafe gir klassisk mat til Emerald City med en prix-fixe-meny som fremhever den klassiske arven i denne byen. Velg en 2- eller 3-retters meny med ditt foretrukne musikalske tema. Enten du bestiller en klassisk cheeseburger, laks, biff, en fullstendig rack med hickory røkt ribber eller vegetariske retter, er du sikker på å ha din appetitt slukket på dette transkontinentale kulturelle ikonet. Hvert alternativ leveres med valg av drikke (kaffe, te og brus) pluss dessert.